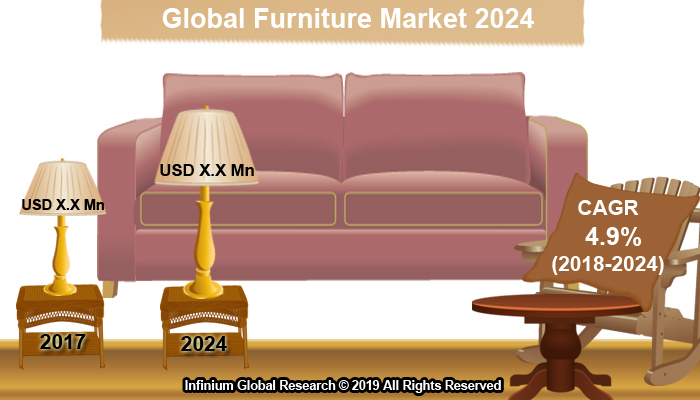 A recent report published by Infinium Global Research on furniture market provides an in-depth analysis of segments and sub-segments in the global as well as regional furniture market. The study also highlights the impact of drivers, restraints, and macro indicators on the global and regional furniture market over the short term as well as long term. The report is a comprehensive presentation of trends, forecast and dollar values of the global furniture market. According to the report, the global furniture market is projected to grow at a CAGR of 4.9% over the forecast period of 2018-2024. The report defines furniture as accessories intended to support various human activities and make life comfortable. Furniture includes chairs, sofas, stools, tables, beds and several other products for enhancing the appearance of a space. It provides comfort during sleeping, seating, eating, relaxing and also offers storage facilities. Furniture products play a vital role in the residential and commercial sector. These products are manufacturing using different material includes wood, metal, and plastic and are available in a different design. Growing population coupled with increasing disposable incomes, particularly in developing economies and increasing household spending is positively promoting the furniture market growth. In addition, development in the housing sector and changing living of standard and lifestyle of the population are some factors are escalating the growth of the market. Apart from this, growing job opportunities and increasing employment across the globe create a necessity for additional office spaces, which in turn, catalyze the demand of furniture market. Moreover, growing investment by government in infrastructural development promotes the growth of the commercial and residential sector, which is expected to increase the demand for furniture product in the near future. A growing number of nuclear families is resulting in demand for space-saving products. This factor is expected to contribute the demand the furniture market growth in the near future. Rapid growth in cafes, restaurants, and hospitals is boosting the growth of the market. Furthermore, expanding investment in the retail sector by various international entities is anticipated to increases the growth of the furniture market in the coming future. Growing inclination towards online and mobile shopping is projected to increase several opportunities for the market during the forecast period. Among the geographic, the Asia Pacific region is exhibiting significant share in furniture market during the forecast period. Rising disposable income, rapid population coupled with improving the standard of living is projected to boost the growth of the furniture market. In addition, government spending on housing projects and the growth in urbanization coupled with expanding IT industry is anticipated to positively impact demand. Europe is projected to the second largest region for furniture market during the forecast period owing to increasing tourism industry driving the hospitality sector, which in turn, generating demand for luxury furniture. The North America region is projected to expand at the highest CAGR over the forecast period. Moreover, consumer inclination towards purchasing luxury furniture catalyze the demand for the market during the forecast period. Growing number of major key players in the furniture market in the Middle East and Africa is projected the grow with significant CAGR during the forecast period. The report on the global furniture market covers segments such as type, material, and application. On the basis of type, the sub-markets include chairs and dining tables, beds, sofas sets, cupboards, kitchen shelfs, office desk, door & door panels, window frames, and others. On the basis of material, the sub-markets include wood, plastic, metal, and others. On the basis of application, the sub-markets include residential, commercial, and industrial. The report provides profiles of the companies in the market such as Wipro Furniture Business, Kinnarps AB, Creativewood, IKEA Systems B.V., Godrej & Boyce, Williams-Sonoma Inc, KOKUYO Co., Ltd., Herman Miller, Inc., Steelcase Inc., Ashley Home Stores, Ltd., and HNI CORPORATION. The report provides deep insights into the demand forecasts, market trends, and micro and macro indicators. In addition, this report provides insights into the factors that are driving and restraining the growth in this market. Moreover, The IGR-Growth Matrix analysis given in the report brings an insight into the investment areas that existing or new market players can consider. The report provides insights into the market using analytical tools such as Porter's five forces analysis and DRO analysis of furniture market. Moreover, the study highlights current market trends and provides forecast from 2018-2024. We also have highlighted future trends in the market that will affect the demand during the forecast period. Moreover, the competitive analysis given in each regional market brings an insight into the market share of the leading players.